We’re at war! What side will you choose? What is the Bandana Army? The Bandana Army is a civilian-based operation, comprised of revolutionaries on a mission to save lives and end distracted driving, #BecauseAnthony. Our grassroots assembly of concerned citizens spans over the entire state of Florida and continues to grow, with new factions forming in support of our cause all over the nation. 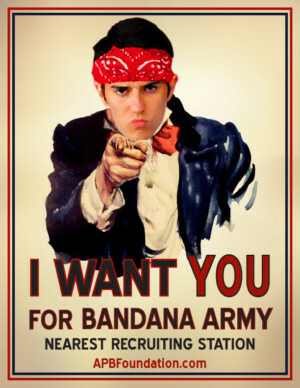 We want YOU in our Bandana Army! Enlistment in the Bandana Army is open to all civilians who wish to help save lives and serve in the revolution to end distracted driving. Help us win the war against distracted driving – Enlist below! I pledge to never drive distracted. I vow to speak up if I am ever in a car with another distracted driver. I promise to talk with my friends & family about the importance of driving without distraction! Arm Yourself with the Facts! Why Do We Need A Revolution? Distracted driving is both a social and moral problem. In order to attack it, it will take an army of people saying, “My life is worth more…” It will take people being disturbed rather than amused by videos filmed while driving. It will take you replying to your friend, who sent you a Snapchat while driving, saying “That’s not okay - You could have killed yourself, or my loved one.” It will take you being personally offended that when this behavior occurs people are really telling you, “Your life is not as important as this text message I am trying to send or this sandwich I am trying to eat while driving.” The Bandana Army is mobilizing. Will you be on the right side of history? Join our revolution and help us save lives.